The material rattan comes from Asia, with the majority coming from Indonesia. It is a type of vine that grows, and can even grow up to 100 metres long. As it is one of the strongest woods, it is commonly used to make furniture. 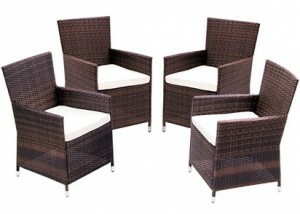 A set of rattan garden chairs will be a perfect addition to any garden, patio or balcony since it can nicely blend in. 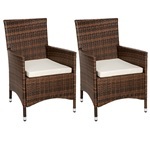 However, they do take up a bit more room than most 2 seater garden bistro sets as the rattan chairs are not foldable. Many of the garden bistro sets can be folded and easily stored away to save space, therefore, if you’re limited on space, perhaps a bistro set might be a better option. Rattan garden furniture is highly popular as not only does it look nice and appealing, but it also has many other benefits. Most rattan garden furniture is not made from natural rattan, in fact it is made from synthetic woven rattan, as this is more resistant to UK weather conditions. With plenty of options to choose from, deciding what type of chairs to buy for your garden can be a bit challenging. Below is a list of the pros and cons of rattan garden chairs, so hopefully this can help you decide whether it’s suitable for your garden or not. Looks good – Most people would buy furniture so it matches with what they already have. With a set of rattan garden chairs, it tends to look in place with whatever else you have in the garden so you don’t have to worry about finding the right set of chairs or a set of chairs that match. Weather resistant – Rattan furniture can be used indoors or outdoors and is designed to be weather resistant, so you can leave the furniture out in the garden all year round! 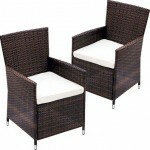 The rattan garden chair cushions however should not be left out in bad weather conditions. Space saving – As it is designed to be weather proof, this means you won’t have to store it away in the shed or garage during bad weather conditions. Strong and durable – Rattan is one of the strongest woods, therefore the furniture made from rattan is also going to be very strong and durable, and this also means that it’s likely to last for at least a good few years. Easy maintenance – Rattan furniture requires little maintenance and can be done without too much effort. 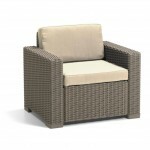 Click on the link for the best way to clean and care for your rattan furniture. It can also be easily cleaned with an electric power washer. Comfort – Sitting on rattan chairs without any cushioning will still be quite comfortable as the material isn’t rock hard, but most manufacturers will include a cushion to make it even more comfortable. Before the chair is made, the making process involves bending the rattan into the desired shape, so this allows more flexibility in designing the chairs to give maximum comfort. 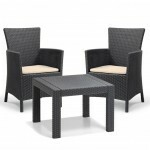 Lightweight – Rattan furniture tends to be quite light but yet strong and durable at the same time. The materials used allows the furniture to remain light, therefore moving the rattan chairs from one place to another can be done with little effort. 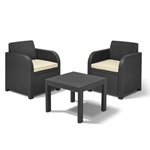 Price – On average a rattan garden chair is more expensive than “the average garden chair”, but if you buy sets of 2 or more then it would usually work out cheaper than buying them individually. Space/unstackable – Although it is designed to withstand weather conditions, meaning you can leave it out in the garden all year round, some people would rather bring the rattan chairs in during bad weather conditions. As the chairs cannot stack on top of one another this will this will take up a lot more space if you prefer to bring the chairs in, but by doing this you’ll probably prolong the life of the furniture and keep it in better condition. Loss fibers – As with most furniture, after prolonged use the natural fibres could eventually loosen. This can easily be fixed by either taking the chair to a furniture shop to have it repaired or you can simply D.I.Y. Indoors or outdoors – The rattan chairs are portable so can be placed wherever you feel like, but it usually will stay in one place, so you’ll need to decide where it’s mainly going to be placed and whether there’s sufficient space. They can still be kept in the shade outdoors if you place the chairs under a cantilever parasol. Keep it out or put it in storage – You can leave it outside all year round but it will remain in better condition if it’s stored away when not in use for a long period of time. If you plan to leave it out then it would need to be well maintained, and if it’s going to be stored away then you’ll need to ensure there is enough space for wherever you plan to store it. Number of chairs – If you regularly have a few people over then it might be worth investing in a couple of extra chairs. Some rattan garden chairs can be bought as a set of 4 which will work out to be cheaper than buying them individually, but most of them can be bought in pairs.